Realizing the important role that librarians play in ensuring that their library clients are information literate, the DLSU organized a symposium on Library Instruction Make-over: Developing an Engaging Information Literacy Program which aimed to raise awareness on the importance of information literacy being a vital component of lifelong learning; help librarians and LIS students develop new strategies in teaching information literacy skills; and understand the issues and challenges in teaching information literacy skills while at the same time promoting the reference services and programs of the DLSU Libraries. Learning by doing is more fun and interesting. This was the inspiration of the Libraries in gamifying the IamInfoSMART 2014 thus adding a little excitement and engagement among students as they develop their information literacy skills. The Libraries successfully concluded its Information Literacy (IL) campaign called IamInfoSMART with the theme, “Activate the Learners! : Empowering InfoSMART Lasallians Through Engagement”, held on 10-14 November 2014 at The Learning Commons. With the advocacy to provide lifelong learning and engagement through the community of learners outside the DLSU academic community, the DLSU Libraries in partnership with the American Corner Manila has sponsored a free lecture to selected Secondary Public Schools in Metro Manila. 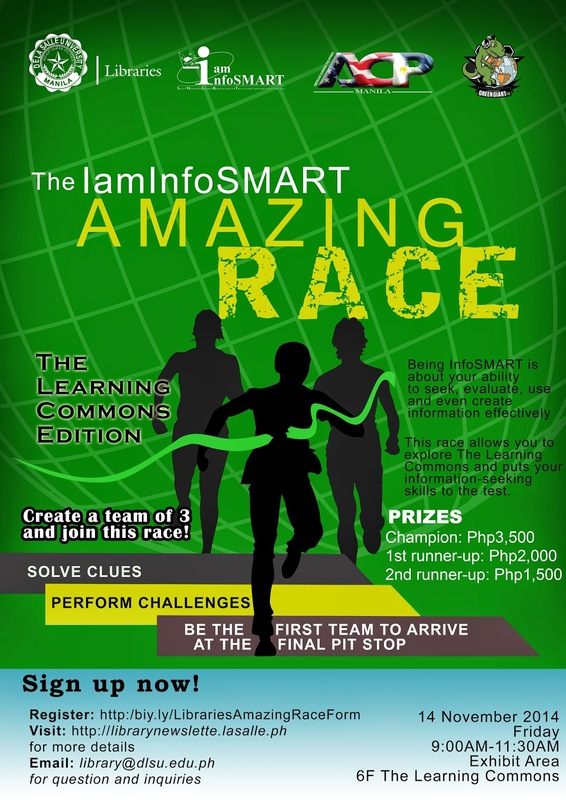 This is part of the Community Extension Program of the DLSU Libraries entitled WeAreInfoSMART. As part of the IamInfoSMART campaign, the Libraries conducted a TeachMeet with LORA, the Librarian held at the Ortigas Room of the Learning Commons on 13 November 2014. This TeachMeet is an organized but informal learning activity designed for librarians of public secondary schools in Manila and Mandaluyong, which aims to share ideas and experiences in accessing open access electronic resources. In addition, a one-hour lecture on creating a good pathfinder was given by Ms. Marian R. Eclevia, Readers’ Services Coordinator. Now on its fourteenth year, the American Corner-Manila based in the De La Salle University (DLSU) renewed its partnership with the Public Affairs Section of the United States Embassy Manila through the ceremonial signing of the Memorandum of Understanding (MOU). 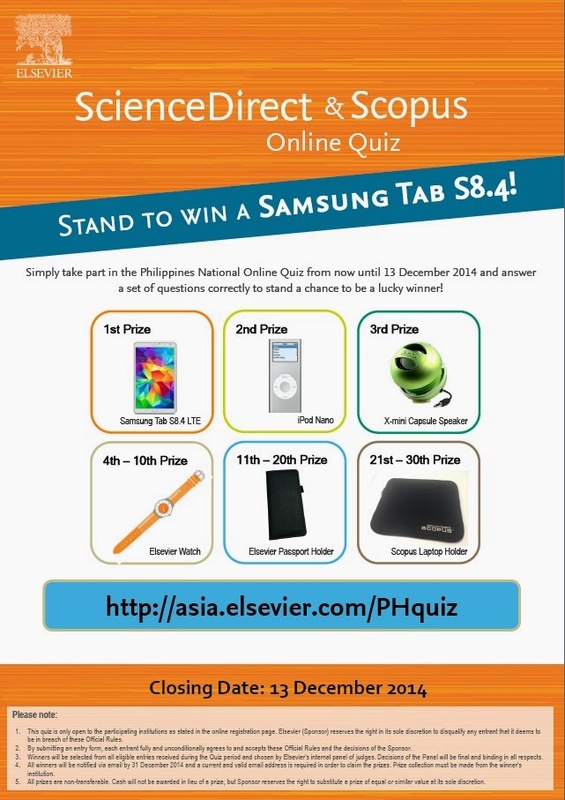 We are pleased to announce to the community that Elsevier is holding the ScienceDirect and Scopus National Online Quiz from now until 13 December 2014. This quiz is open to all students, faculty and staff of the DLSU academic community. Answer the questions correctly and get a chance to win any of the following PLUS MORE! Winners will be selected from all eligible entries received during the Quiz period and chosen by Elsevier's internal panel of judges. Children have an innate love of stories. Stories create magic and a sense of wonder. It is with these stories that we learn about life, ourselves and others. Storytelling is one way for children from all walks of life to develop an understanding, respect and appreciation for other cultures. It can promote a positive attitude to people from different lands, races and religions. The 80th World Library and Infomation Congress (WLIC) of the International Federation of Library Associations and Institutions (IFLA) was held on 16-22 August 2014 at the Lyon Convention Centre in Lyon, France. This year's theme is Libraries, Citizens, Societies: Confluence for Knowledge. This 7-day Congress saw a delegation of nearly 2,000 library and information professionals from all over the world, where it became a venue for knowledge sharing, collaboration and networking. IFLA is the international organisation for library and information associations, institutions and librarians and the trusted global voice of the library and information community, and drives equitable access to information and knowledge for all (IFLA, 2014). It holds an annual conference, general assembly and trade event attended by information professionals coming from 150 countries. 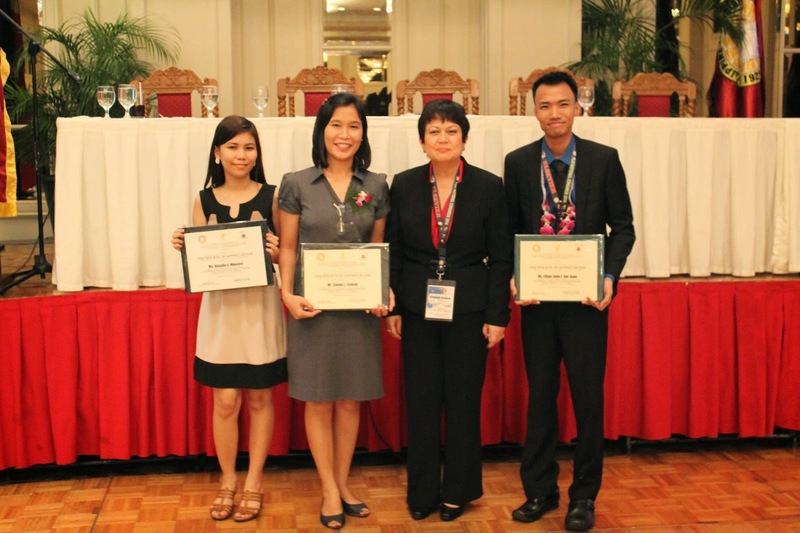 Seven (7) Filipino librarians presented their research papers and poster in various sessions during the conference. Among them are DLSU librarians Christine M. Abrigo and Marian R. Eclevia. On conference day 3, Abrigo's paper, with co-author Vincent M. Abrigo of UP Diliman entitled, "Keeping it an open book: exploring the knowledge sharing experience of librarians in the Philippines", was presented among the 4 papers in Session 109: Knowledge Management Initiatives and Development in Asia and Oceania. The paper dealt with the kind of implicit and explicit knowledge outputs being created by Filipino librarians, how they manage to preserve, share knowledge and their discretion to collaborate with other knowledge generators (read full paper HERE). Meanwhile on conference day 4, Eclevia's paper, collaborated with co-authors Rhea Rowena U. Apolinario, Carlos L. Eclevia, Jr., Eimee Rhea C. Lagrama, Karryl Kim A. Sagun of UP Diliman and Ateneo de Manila University, entitled, "Librarian as researcher and knowledge creator: examining librarian's research involvement, perceived capablities and confidence", was presented in Session 150: LIS Education in Developing Countries for Strong Libraries and Strong Societies. The paper tackled the current research practices of Filipino librarians, their research skills, involvement and productivity from 1993-2013 (read full paper HERE). The delegates were also treated to a night of dancing, téte á téte and traditional French cocktails during its cultural evening held on the night of day 4 at the La Sucriere, a former sugar warehouse on the banks of the Saône River in the Lyon Confluence district. The Green Spine Book Fair, a 3-day event which include interesting discourses and other related-activities, hosted a lecture in partnership with the American Corner Manila, entitled, From Books to MOOCs: Massive Thinking in Today's Online Library Programming held on August 13, 2014 at the 6/F of The Learning Commons.​ This served as an ideal complementary topic for this year’s book fair theme, Creating Synergy: Finding a Parallel Place for Print, E-Books and Human Books in Academic Libraries. 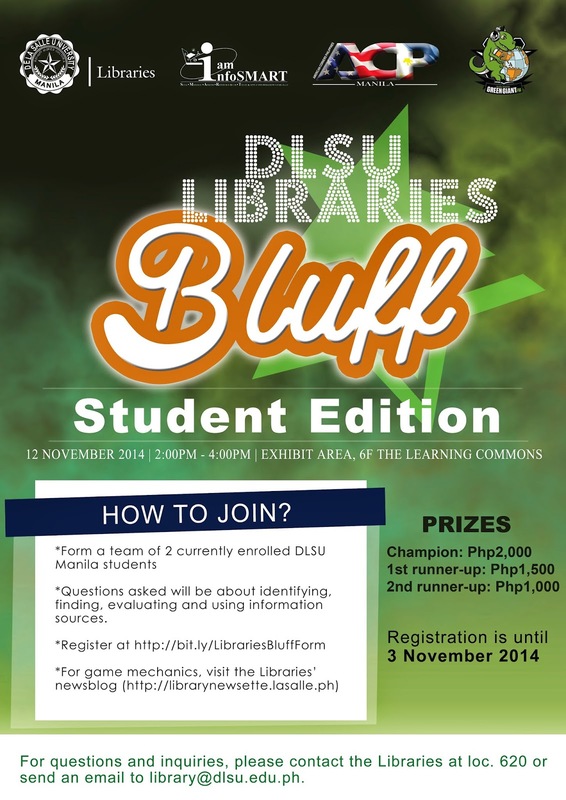 To continually provide support to the research and learning needs of the entire DLSU academic community, the Libraries organized The Green Spine Book Fair 2014, an annual event, now on its third year, that serves as a venue for faculty members, administrators and even students to select and recommend books and other materials for possible acquisition of the library. This year’s theme “Creating Synergy: Finding a Parallel Place for Print, E-Books and Human Books in Academic Libraries,” aimed at promoting the value of information sources in all formats and allow members of the academic community to explore the use of materials in other media aside from the printed materials that they have been used to. Congratulations to the following twitter winners of the recently-concluded #Selfienomenon contest!